The lightest, most portable sluice available. Great for backpacking. Made of polypropylene plastic with 2 ABS plastic Hungarian riffle systems with miners moss pads the entire unit weighs less than 2 pounds. Custom corrugation molded into the plastic, traps gold making recovery awesome and set-up a breeze. 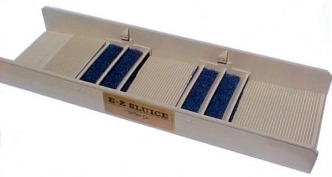 The E-Z sluice is black, 2 1/2" deep, 24" long and 7" wide. Dont let this small two stage sluice fool you. It can process lots of material and is still easy to get to the creek. 9 inches by 24 inches. I offer many more sluices than shown here. Look for the full line of RDH Prospecting sluices and highbankers. Let me know what you are looking for and I will get you a price. If you plan on making a purchase somewhere else let me know first and I will do everything possible to beat all prices.